If summer means having more time on your hands and less money in your wallet, you may be looking for cheaper ideas to keep busy. 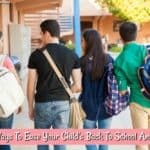 Let’s face it, most of us can’t afford to go on vacation for the entire summer, so coming up with a variety of activity ideas can help calm the anxiety and help you to really enjoy the time. 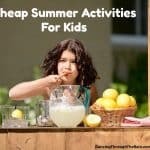 Think cheap summer activities for kids, cheap summer games, free summer activities – any money saving moves will help, so here are some ideas to get you started. If you want to invite some friends over, a cheap way to entertain is to have a pot-luck barbecue! You can make things like hot dogs and hamburgers, and ask friends to bring sides and desserts. It’s a great way to enjoy summer without having to worry too much about the cost. If you have a tight-knit group of friends or a close neighborhood, talk to them about everyone hosting a different barbecue date during the summer. Everyone contributes, you split the cost and the locations, and you get to spend time with great people. Here are some other cheap meals for summer entertaining to help you expand the menu. If you love to read but never have the time, summer can be a great time to catch up. You can visit the library to get physical books or download digital books from most libraries. A Kindle Unlimited subscription will also keep you entertained all summer long for $9.99 per month. There are literally thousands of books to choose from with more books being added each day. You can read Kindle books on your computer, tablet, or smartphone if you don’t have a Kindle, and you can cancel at any time. If you have children, this is a great way to get them reading as well. A great way to beat the heat is to crash in front of the TV. A Netflix subscription starts at $7.99 per month and gives you access to thousands of movies and TV shows. 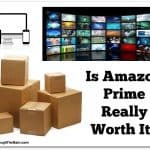 Amazon Prime members have access to tons of different shows as well. If you want to get caught up on all the great shows you missed – and many you may never have heard of – grab a bowl of popcorn and hit play. A solution for those particularly hot days and nights! Summer is a great time to wash your car yourself, but you can also turn that into a water day. Pick up some water balloons at your local Dollar store, put on bathing suits and play! Bring out the sponges to get the car clean, spray each other, and just enjoy the day. Don’t forget the sunscreen! Planting a garden is not only an inexpensive summer fun activity, but it will also help you save money in the long-run. Anything that you can grow yourself is an item that you don’t have to purchase at the grocery store. Think through what produce or herbs grow well in your area and start there. You can expand as you go. If you don’t care for having to tend to fruits or vegetables, plant some summertime flowers or an ivy garden. Summer is a great time to learn a crafting platform that you’ve always wanted to try. Bluprint offers online classes that will teach you to crochet, create jewelry, paint and more! You can find kits for most crafts both online and at your local craft store (think Michaels and Jo-Ann Fabric). These options allow you to try a craft before investing too much money. If you don’t like it, move on to the next thing you want to try. Planning a garage sale will not only keep you busy, but it will help you clean out your house AND make you money! Get the entire family involved in pricing things and searching through the house for items that you no longer use. To encourage the kids to get rid of older toys, think about offering to give them the money that comes in from selling those specific items. You get your house cleared out and the kids have incentive to clean out their rooms. More interested in shopping at garage sales than having one yourself? Find out how to get some great bargains! A road trip is a great way to get out of the house without breaking the bank. It might be a trip to a lake or national park, but the key is to choose a nearby location so you don’t spend a lot on gas. Be sure to bring along your own snacks and drinks so you don’t overspend at convenience stores – and bring things to do in the car on the way. If road tripping is your “thing,” try heading to a different location every other week. 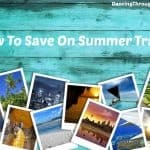 Read more about how to save on summer travel before heading out. 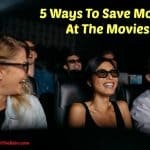 If it’s getting toasty outside and you want to stay indoors, a movie marathon is a great way to stay entertained. Choose a theme and make food or snacks that matches the theme. For example, you could watch your favorite childhood movies and make your favorite childhood snacks. Watch the entire Star Wars series and serve “Yoda Sodas” (lime sherbet and 7-Up) and Star Wars Cupcakes. Watch Ferris Bueller’s Day Off and serve Gummy Bears. There are a million options! Everyone has a list of those things they’ve been “meaning to do.” Well, now is the time to do them. Have you been meaning to paint the bathroom? This is the time! Have you been meaning to do some genealogy research? You’ve got the hours! Have you been meaning to organize the basement? That’s a good place to start on a hot day! Turn those things you’ve been “meaning to do” into actual summer activities. Sports are a great way to stay entertained during the summer. There is something for everyone. 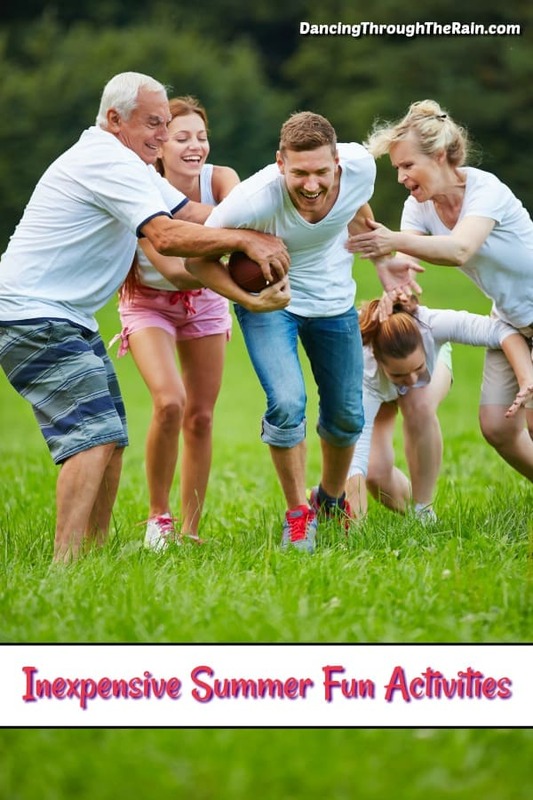 Whether you like tennis or golf or touch football or kickball, going outside with a ball is a great way to hang out with friends and family. Check your local recreation center for equipment if you need it or play something that requires nothing, like capture the flag (all you need is a shirt!). If you can’t find a rec center that provides equipment, ask a neighbor or look for cheap equipment in thrift stores or at yard sales. You really don’t have to spend a lot of money to have fun this summer. 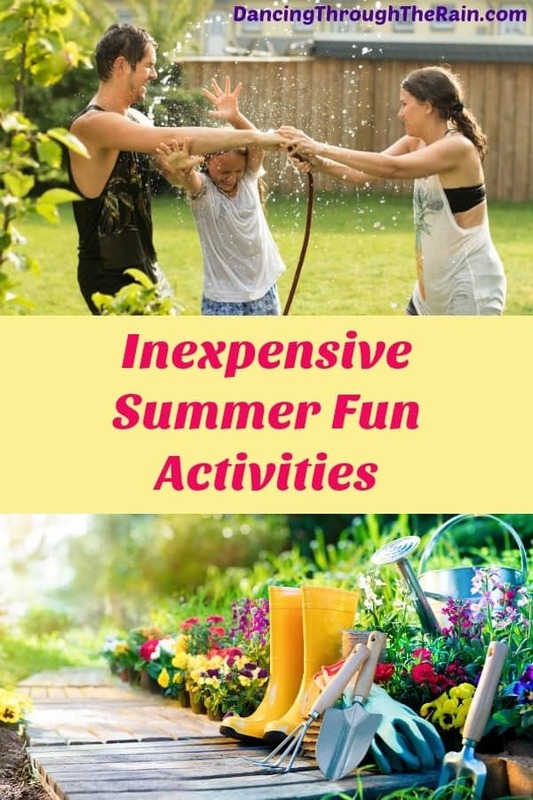 There are tons of inexpensive fun summer activities to participate in, you just have to be a little creative. Keep cool and have a good time!